If you’ve ever gotten a cut on a knuckle, knee or ankle, you know how hard it can be to find just the right bandage to protect your boo-boo. You can buy the enormous variety packs, but after you’ve used up all of the most common sizes you’re left with a pile of those tiny square ones that no one ever needs. 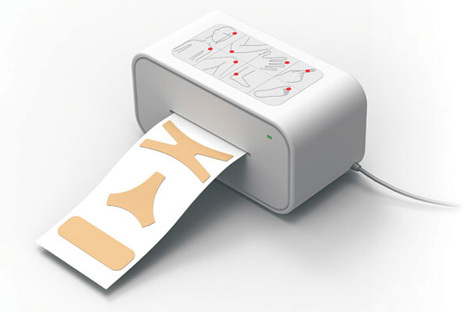 The designers at EVENdesign think they’ve come up with the perfect solution: a printer that spits out only the perfect bandage for your particular wound, only when you need it. 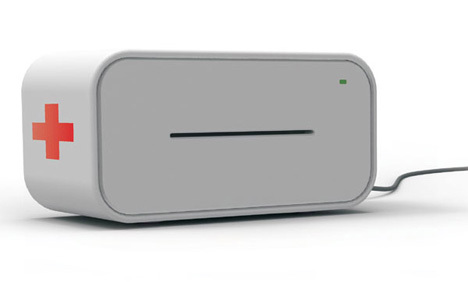 The designers attached the Band-Aid brand name to their concept, calling it the Band-Aid Printer, but there is no reason this idea couldn’t be picked up by a different company. It works kind of like a small, simple 3D printer in that the pieces of bandage are produced only when needed and to the user’s specifications. According to the designers, who won a Reddot Design Award for the concept, the user can adjust the skin tone of the bandages – thus taking care of another nagging issue which has always plagued users of packaged bandages. See more in Unbuilt Concepts or under Technology. February, 2013.